Never seen a high-res version of the scan, plus it had weird colour and weird black noisy stuff....time to vector! The hardest part was probably getting the colours right. I had to redo some of the outlines over too. Her eyes were very simple, but they were a different style than what I'm used to. Plus I added the white parts inside her eyes to make them look more interesting. I extended the top of her hair since it was cut off, very straightforward. The name...I know in this picture she looks more "thoughtful" than "reminiscent", but when I see her with that pose I can imagine her remembering events of the past, and so I called it Reminiscence. It's a nice one, since the original one was uber small. Anyway, keep it up the great job! You have a point that her pose makes Winry look like she's thinking of the past. cool man your vectors are like always sharp, and i see your skill is improving in your lineart which is a good thing. i'll fav it! Nice vector. Clean and simple and yet trully beautifull. 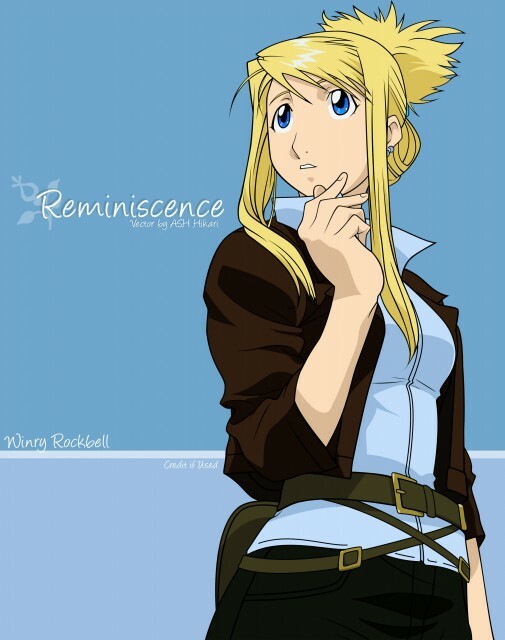 Winry makes me ponder about certen things too. Good one. ~P.S. I love the outlines. How did you do them? 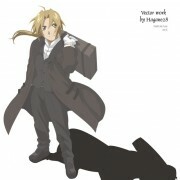 I like pic! 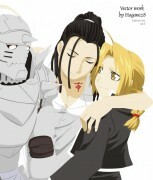 I love winry! Neat! Im normally not into Rozen Maiden wallies, but in this case, I'll make an exception. It looks great!